Benefits of Licorice blocks can be use in many aspect of industries like drug industry or food industry. 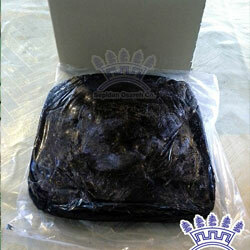 We Produce Licorice Blocks (Licorice Extract Blocks). We can produce Liquorice Extract Blocks with any Analysis that you may want. Liquorice (American English: Licorice) is the root of Glycyrrhiza glabra and Glycyrrhiza inflata. The roots are brown, long and cylindrical and have to be 3 to 4 years old before they can be harvested and dried for extraction. Liquorice extract is produced by boiling liquorice root and subsequently evaporating most of the water. Its active principle is glycyrrhizin, a sweetener between 30 to 50 times as sweet as sucrose. Liquorice extract is traded as a paste, block or spray-dried powder. Glycyrrhizic Acid (GA) is the most important constituent of liquorice. GA content usually amounts to 7.5-8% in Glycyrrhiza inflata and 5.5-6% in Glycyrrhiza glabra. Glycyrrhizin, starch, gums, sugars, moisture and ash are other constituents. Use the extraction method (temperature, pressure, time) which results in a composition according to buyer preferences. Producing different batches of liquorice extract with a consistent flavour profile is a major challenge. It requires quality control for raw materials and strictly controlled processing. Do not add additives to the extract unless specifically agreed upon with your buyer. Any use of additives should be specified in the Technical Data Sheet (TDS). Clean roots before processing to remove other plant material and prevent contamination by foreign materials (e.g. soil) by keeping facilities and equipment clean. Buyers will measure ash content, which will be high if it contains a lot of soil. Adress:Sepidan Osareh Co., Kilometer 60 Shiraz-Sepidan Road, Homashahr, Fars, Iran.